being pretty new to quilting im still learning. I have limited chances to get direction in person so have been using mainly video’s and books to try and learn. This is my latest attempt, found from a Missouri star tutorial, I’ve found it much easier to follow video directions rather than written directions. I would really appreciate feedback ... for instance, I see my points aren’t all touching but really don’t know what I did wrong? What other things do I need to work on? All help is greatly appreciated! I think it looks very good for a beginner. We all see our own mistakes and are our own worst critic. What I can say is keep going, you're doing better than I did when I first started quilting. Skills get better with practice. It took me several years before I made a quilt top with out an obvious mistake in it. At the rate you're going it will be much sooner for you. It looks lovely! If you are talking about your outer points, you don’t want them to touch the edge. They need to have a quarter inch beyond them for the seam allowance, so the points don’t get cut off when you sew the block to other blocks. Yours look perfect on that score! Just be sure to cut accurately, sew a scant 1/4” seam, and keep practicing. Welcome to your new hobby, quilting. This is a great first attempt. You probably wont find anyone to criticize your work here. We look, admire, and sometimes share tips and techniques. I recommend you enjoy your first quilt, and know that improvement comes with practice, practice, practice. youtube is filled with visuals on techniques, I found one that might help you: https://www.youtube.com/watch?v=Dq5DFn6fc6U which is titled " the Best tools to Improve your Quilting Accuracy". Note that one of the downfalls of this hobby is that we tend to be over critical of our own selves and our own work. Don't that discourage you. Mush on. Most of us won't see anything "wrong" with your lovely creations. I looked at this and thought 'great quilt, it's lovely', and that I will put this on my bucket list to use up fabric for Linus quilts. After I read your comments about your points, I had to go back and look. It wasn't something that I'd noticed. Keep on sewing and the basics, seam allowances, checking points etc, will become second nature. You asked, so don't shoot me.....I'm meticulous when it comes to matching up points. This would drive me nuts. But that's me. My first quilt was a Lone Star kit. I had hundreds of little diamonds to sew together & match points. I did a lot of ripping before I got them all right. The more you do, the better you get at it, the easier it gets. If you haven't trimmed off any of the points after you stitched, you could rip them out & try again. I would suggest you take your time. Slow & easy wins the race when it comes to many detailed quilts. I would suggest you mark your points at 1/4 inch & pin before sewing. I like to use a white chalk pencil. Some of the colored chalks may not wash out. Use a walking foot if you have one. When sewing on the bias it often stretches, so the walking foot will help. Let the machine do the work, do not pull on the fabric. Instead press down on the fabric & let it feed thru the machine. Do a test sew & make sure the needle enters the fabric at the 1/4 inch mark or scant 1/4 inch. Accurate seams are a must when piecing. Use a seam guide. When working with fabric that will have bias edges it helps to starch it before cutting & sewing. You can still starch & Press, not iron, your pieces. Pressing is just setting the iron down, picking it up & moving it & setting it down. Ironing is moving it across the fabric. That can stretch it. Pressing retains the shape. Love your color choices. It's going to be very pretty. The first quilt I made (4 years ago) is on my bed...I was proud of it when I made it and prouder still when I see all the “mistakes”...few points are correct! ;-). Every time I make another quilt it’s more “perfect” showing my getting more accurate in cutting, seams, etc. my most recent is Deb tucker’s New Years star (pm me if you want to see it) and all points are correct, did cornerstone borders and vertical and horizontal sashing. Your block is fine...keep it as it is and use it as the “measure” of your growth...you’ll be amazed at how you progress...as you merge with your machine you will learn it’s quirks...a quarter inch seam is not the same machine to machine or even quarter inch foot to quarter inch foot. Use the Amish principle...only God can make something perfect, and even God had to do a “do-over”. Don’t obsess...enjoy the journey. This is a wonderful first quilt. Mine was a simple 9 patch and it took me a couple of years to finish the top! It was 50 years before the internet and I didn't know anyone who quilted to help. You are doing super great! The most important thing is to enjoy, relax and keep going. Your quilt is terrific. Feather3 gave great advice. I found that my points were much better when I sewed them with the point pieced fabric on top. That way you can see where your needle is entering the fabric... just a thread beyond the point to allow for turning. Keep going! Last edited by QuiltnNan; 04-26-2018 at 03:53 AM. Not being critical here, just offering some advice on what I think could be your issues. Feather3 did give you some excellent advice. It appears to me you may have both cutting and piecing issues. If you are using different rulers for different purposes - for example a large one for general cutting and a smaller one for trimming - try to make sure all of your rulers are of the same brand. Not all rulers measure the same! For me, it helps me to be consistent with cutting if I put a sticky note or piece of tape on my ruler when cutting mutliples of the same size. Otherwise sometimes you place your ruler on this side or the other side of the line - at least I do! Not sure if your seam allowance is consistent. Again, sticky notes or tape are your friend. I tried one of the seam guide 1/4" feet for my machine and found that the seam allowance was greater than 1/4". My machine has a 'scant' 1/4" position so that is what I use. If I manage to keep my fabric lined up with the edge of the foot, my seams are a 'scant' 1/4" all the way along. I also press my seams open vs to the side. I feel it gives me an overall flatter block but I also feel it makes it more accurate for me to match seams/points. When doing this, I place a pin straight down through the top pieces I'm matching up and then take the bottom section I'm matching and place the pin straight down through that piece. Hold the pin straight up/down while lining up that intersection top/bottom. Once the pin is straight and the top/bottom pieces match, I place pins on either side as close as possible to the straight one. Remove the straight up/down one and then sew. I then pin the balance of the section, matching the ends of the section. If there is a bit of a discrepancy between those two edges, I will 'ease' the larger piece/stretch to smaller piece while sewing ever so slightly. I try to do the 'baggy on the bottom' theory but that's not always possible either. Press your units thoroughly after they are constructed. Measure to see if they are the size they are supposed to be. Trim if necessary. But don't trim off your points! It's a very tedious process but I press each seam after it's sewn to kind of 'set' the thread into the fabric. Then press my units open they way they supposed to be. That is when I measure/trim if needed. You're doing a great job. That's a pretty complicated block for a beginner but I also believe in making things you like regardless of how 'difficult' something is rated compared to what you think your skill level. One of my first quilts was a Leymone Star made with strip sets. Much repositioning of the ruler and trimming while getting that 60 degree angle and lots of pinning. It turned out great! Only a table topper but a great piece nonetheless. No one told me it was supposed to be difficult, lol. No criticism here, I think you have done a wonderful job. As you gain experience you'll get better, but None of us will ever be "perfect", just not possible. First, congratulations on finding a hobby that has a lot of room for creativity and "doing your own thing". Second, you've chosen a beautiful combination of fabrics. Third, I had to look carefully to see what you were talking about with regard to your points - as others have said, we are our own worst critics. What I've found helpful if I find that my points haven't matched, is to take the offending seam apart (yes, I do this a lot), find the place where the pieces are supposed to intersect (sometimes a pencil line helps), and put the point of a pin through both pieces of fabric. Wiggle the top and bottom fabrics between your fingers until the pin stands vertically, then insert it the rest of the way. Now you can sew the seam. A lot of people - me included - make the HST (half-square-triangle) units - the red and white units in your block - slightly oversized and then trim them down. When I cut the square sizes "exactly' - even when I sewed "a very scant 1/4 inch seam" - my units ended up skimpy (too small) - so I add plus 1/8 inch to the directions for those units. Only one of your eight HST units has noticeable points issues - Now the question is - what happened with that one? How did you make yout HST units? There are several ways to make them. I still need to measure each section to see if it's the size I want it to be - it's easier to "adjust" as I go, then when the block is "finished"
Would you be willing to also show a picture of the back of your block? That's where we might be able to get more ideas of where that one unit is wonky compared to the others. Pretty block! When cutting out your pieces, the line on the ruler should be used to measure not the mat. The lines on the ruler also should be on the fabric cut edge not over it for that tiny bit of extra fabric in your pieces. Test by sewing two squares together and measuring the finished unit to see if you are getting an accurate seam allowance. Cut your pieces on the straight of grain whenever possible. Pin any bias edges so they don't stretch as you sew. It is a pretty block. If I rode by on a galloping horse I would not notice your points. I make quilts to be loved and used. Yours is fine! This is the block that I plan to do next! It's so beautiful and I love Jenny Doan's easy instructions for any block. Your block is lovely. The red you chose is vibrant and matches well with the print. Don't worry about your points. The best way to get them straighter is with practice and patience. My beginner quilt blocks looked similar to yours and they are proudly on my couch and bed, and they get me compliments all the time. Now my quilts have much better points and I credit that to learning how to do a better 1/4" seam as well as having more confidence in what I am doing. Are you planning to do all of your blocks in the same colour scheme or are you going to alternate colours? Keep it up, you are doing a great job!! First - I would look at all that you have done right! 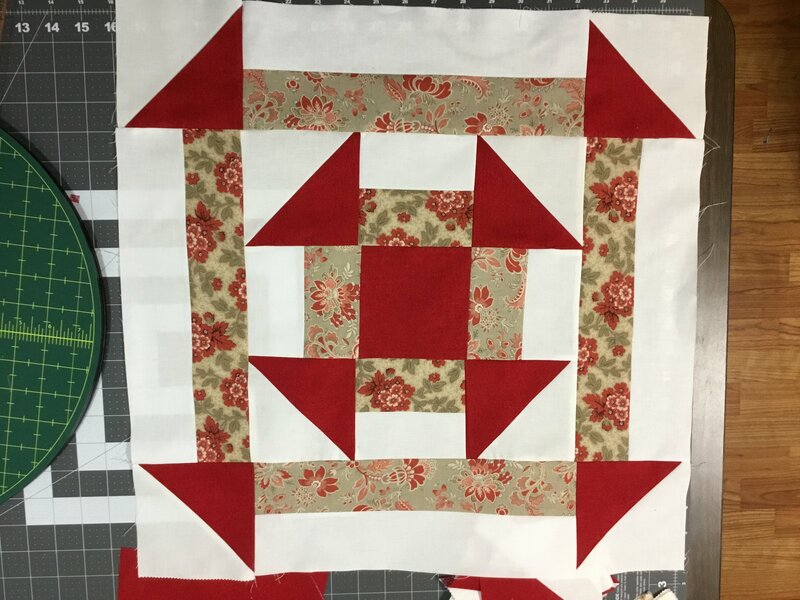 Your colors are lovely and go together very well with good contrast which is half the battle Your block is sewn together, it is square, all of the pieces are in the right place and turned correctly, and it doesn’t appear to have puckers. Each of those things are big accomplishments! Constructive critism of anothers work is hard because we try so hard to be positive and supportive. You are getting some great feedback so I will only add a few thoughts; no one is perfect so don’t expect to achieve that right off, pick an area or two you feel need improvement and focus on those for the next block, use internet searches to find a wealth of ideas and techniques to improve. You may want to google how to nest seams and find a great technique that works for you. Have fun and enjoy the process of making a quilt. Mistakes happen and here we call them design choices! Great job! That's a gorgeous block! I love Jenny Doan's tutorials and like you, I do a lot better with visuals rather than reading instructions. The only thing I see that may be problematic are the outer blocks. The points look like they may be cut off when you sew it to the next block or whatever you're sewing it to. That's a challenge for a beginner for sure. I would just redo those corner blocks. You should be proud ... it looks terrific!!! I wouldn't bother ripping out a single stitch... it's only fabric. As time passes and you go from novice to experienced quilter, you can look back at your first attempts and marvel in how far you've come. My first few quilts are laughable to me (now), but wow, I've come along way and I enjoy having those reminders. Good luck!! Keep it up! When you are sewing your HST together, make sure you are using the 1/4" seam allowance from the edge of the fabric...instead of being straight on I tend to slightly "swing" into my stitching at the beginning and end of the seam..this little bit skews the seam allowance. Mindlessly sew a few pairs of fabric squares together...do you see a little curve in your stitching? If so this could be the problem. (Ask me how I know!) I think this is more noticeable with HST because the point isn't right. So how to avoid this swinging? Sit squarely in front of your needle so that you are feeding the fabric in squarely. At the end of the seam chain piecing another unit through..this helps me keep the pieces in straight alignment. One of the reasons I like Bonnie Hunter's leaders and enders technique is because I always have something to chain piece and keep me straight sewing. This is a good tutorial, but notice that all of the seam allowance is nice and even. Your are coming along beautifully...enjoy this new hobby. I hope it will give you a lifetime of pleasure as it has given me! Last edited by oksewglad; 04-26-2018 at 06:10 AM. I suggest you watch the videos on YouTube of quilt on a day/Eleanor Burns....you will learn a lot! First of all-your block is beautiful and I love your fabric choices. I think you have done a great job and you seem to be getting a lot of wonderful advice. All I can add is that I learned to sew a scant 1/4" and sew slowly and carefully. You are off to a great start and just practice, practice, practice. Good luck and welcome to the quilting world-it is a great hobby. It's hard to make suggestions without specifically knowing what techniques you are using. I like written directions, so when I was starting out, I read a lot of books about the fundamentals of piecing. Since you prefer visual directions, maybe you could google topics like pressing, cutting, and techniques for matching seams, to make sure you are doing those things properly. The main thing is just to keep on piecing, and you will improve with every project. I highly recommend doing the Bonnie Hunter mystery each winter. She gives great directions, and my piecing has improved greatly from doing those mysteries. I go to my ironing board and place a pin through the points that need to match. Once I am satisfied with the pin, I make the pin go straight up and down into the mat as much as possible. This makes sure the points are matched up. I then place a tiny dot or two of Elmer's glue in the seam allowance next to the pin and use my iron on that seam allowance for a few seconds to dry the glue. Repeat for each point. Now, when I take the pieces to the sewing machine, I have glue instead of pins holding the points together. If there is excess fabric between the "pins", I can ease that in as necessary. If there are points, I sew with the point-side up so I can see where the seam intersection is. If there are points on both sides of the pieces, I will sometimes sew through one point, remove from sewing machine, flip the pieces over, and sew from the other side. To increase cutting accuracy, it's a good idea to starch the fabric before cutting. Starch stabilizes the fabric so you get more accurate cuts. Starch also helps with bias edges, as it stabilizes the fabric so the bias edge is less likely to distort as you sew. You can use heavier starches, but even spray starch is enough to help with this step. Your block looks very nice! Your fabric choices are lovely. I have recently pieced a Lone Star quilt - with 512 diamonds in it, I've gotten a lot of practice with getting my points just right. Here are my thoughts and tips. 1) Be aware of the challenge of seam intersections with one or more diagonals. When you are sewing lots of squares together, seam intersections are pretty easy; provided that the seams are lined up as you feed the fabric into your sewing machine, sewing a little bit to the right or the left of the ideal sewing line does not mess up the intersection. When there diagonal seams, everything is much fussier; swinging just a bit to the right or left will result in either a point being cut off or the point not quite reaching the intersection. So, getting good points in a matter of both aligning the fabric properly before sewing and sewing in exactly the right spot. 2) Before I put tricky/fussy pieces together, I mark my 1/4" sewing line on the back of the fabric with an erasable fabric pencil. 3) To align the pieces, I put a straight pin through the sewing line (back to front) at the exact point I want at the intersection and check the front side, then put the pin through the second piece (front to back), again at the exact intersection point, and make sure the pin is coming out on the sewing line on the second piece. Have the fabric at about the midpoint of the pin. Hold the two pieces very firmly together; you don't want any gap between them. Make sure the pin is perpendicular to the fabric; if it's not, slide the pieces so that it is. Use a straight pin on each side of the alignment pieces to pin them together. When pinning, use a low angle through the fabric to avoid distorting the intersection. I usually bend the fabric a bit as I am pinning to get the low angle. Hopefully after pinning, your alignment pin is still close to perpendicular to the fabric; if it's not, remove the two pins and try again. Once you've got everything looking good, you can remove the alignment pin. 4) When sewing, slow down at intersections and make sure that you are *exactly* on the marked sewing line. Many sewing machines will naturally want to pull a bit to one side when they encounter the extra bulk of an intersection. I some times do the few stitches near and at an intersection by turning the hand wheel on the machine; this allows me to make sure those stitches are exactly where they should be. It also allows me to leave the two pins in while sewing the intersection. 5) After you've sewed a seam, you will sometimes find an intersection that is only slightly off. You can correct minor errors by resewing only the intersection involved, rather than ripping out and redoing the whole seam. If the point is cut off, you would have to rip out the stitching at the intersection and resew with a slightly smaller seam allowance. If the point is not quite reaching the intersection, you can leave the original stitching alone and sew the intersection again with a slightly larger seam allowance. I don't know if you have any issues with cutting accuracy, but I discovered that I was making a small mistake and I suspect many other quilters make it, too. When setting up your ruler for a rotary cut, make sure the measuring line is actually on the fabric, not next to fabric. If it's next to the fabric, your cut will give you piece a tiny bit too small. I make sure the line is fully on the fabric, and usually about one thread over. I find a walking foot helpful with feeding everything evenly into the sewing machine. Welcome to fun hobby of quilting! Enjoy the journey. Last edited by platyhiker; 04-26-2018 at 12:08 PM.